As per our previous article, we take a tutorial on common base transistor tutorial. Here we take the complete tutorial on common emitter transistor configuration. here we take look into what is common emitter transistor configuration, Common emitter configuration for npn transistor, common emitter configuration of pnp bjt, why common emitter configuration is widely used?, input-output characteristics of common emitter configuration transistor? 1.2 Why common emitter transistor is widely used? In common emitter type configuration, emitter terminal is common between input and output circuit of transistor. Hence it names common emitter type transistor configuration. In common emitter transistor configuration input is applied between base-emitter junction. the output is taken from a collector-base junction. Common emitter configuration can be applied on both types of transistor, PNP transistor, and NPN transistor. Here we especially talk about common emitter configuration of bjt. For common emitter configuration of NPN transistor, we take an emitter terminal is common between the input and output circuit of the transistor. You can see below fig 1 shows the common emitter connection of npn transistor. For common emitter connection of the PNP transistor, we take an emitter terminal is common between the input and output circuit of the pnp transistor. You can see below fig 2 shows the common emitter connection of pnp transistor. For common emitter connection, the input current is base current ( Ib ) and the output current is collector current ( Ic). Base amplification factor is generally the ratio of output current to the input current. For common emitter connection, the Base amplification factor is the ratio of change in collector current ( ΔIc) to change in base current ( ΔIb). In generally any transistor base current is almost 5% of total current. So, the value of current amplification( ) is greater than 20. Value of β is between 20 to 500. Characteristics of common emitter transistor represent the behavior of transistor for some input and output in a graphical way. By the understanding characteristics, we can easily understand about the behavior of common emitter transistor. Here we look into the input and output characteristics of the transistor. Input characteristics is a curve between base current ( Ib ) and base-emitter voltage ( Veb ) at a constant collector-emitter voltage ( Vcb ). You can see the input characteristics in the figure. Base current is taken on the Y-axis and base-emitter voltage is taken on the X-axis. Here we take the reading of base current and base-emitter current at a constant collector-emitter voltage ( Vcb ) = 1 V and then after 10 V.
You can see the characteristics above. The following points can be noted by input characteristics. This curve of characteristics looks like the same as forward diode characteristics. So, we can say the base-emitter section works as a forward biased diode. In this characteristics as you can see base current is increased with base-emitter voltage. For common base connection, the input resistance of a transistor is the ratio of base-emitter voltage to base current( Ib ). The value of this input resistance is in order of hundred ohms. Output characteristics is a graphical representation of output current and output voltage. 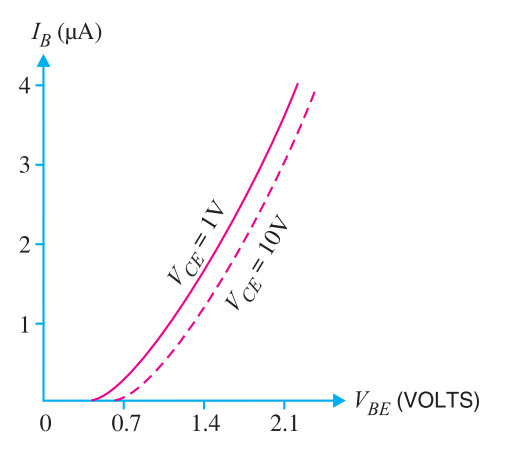 For common emitter output characteristics, it curves between collector current (Ic) and collector-base voltage(Vcb) at a constant base current (Ib). You can see the output characteristics curves above. 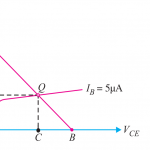 This curve we can draw by keeping base current constant in the circuit and take a reading of collector current(Ic) and collector-base voltage (Vcb).Then collector readings are taken here on Y-axis and collector-base voltages are taken on X-axis. As you can see above fig first we take readings of collector current and base-collector voltage at constant base current (Ib) = 5μA and then we take reading on various base current values. 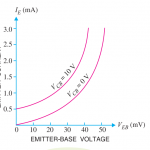 By fig we can see that collector current only varies in below 1 V base-collector voltage. 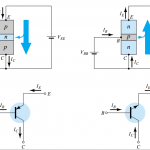 After that collector current becomes constant and independent of base-collector voltage. At a value of voltage in which current becomes constant this voltage is known as knee voltage. Transistor always operated above knee voltage. Above knee voltage, Ic is going to be constant so after that, there is small Ic increases with Vce increase. This proves that output resistance is going to high as compared to input resistance. For any value above the knee voltage value of Ic = β x Ib. Output resistance is generally the ratio of output voltage to output current. Here for common emitter configuration output current is Ic and output voltage is Vcb. So, for common emitter connection, output resistance ( Ro) = change in Vce / change in Ic. As we see above in points of output characteristics, the output resistance of a circuit is high. In this connection, output resistance is in a range between 50 KΩ. Why common emitter transistor is widely used? Common emitter transistor is first preferred in any application of transistor. But here some advantages of this transistor because of that in practical life this transistor used in most applications. Common emitter( CE) transistor have some advantages over the common base and common collector connection. Common base( CB) Transistor gives high current gain but low voltage gain. In another side, common collector( CC) transistor gives high voltage gain but low current gain. In CE transistor it gives high current gain and high voltage gain. This is the main reason for use in a most amplifying circuit. CE transistor is best for amplifying circuits because of it has high power gain ( because both current gain and voltage gain is high). Hence it uses widely in many application. hope you well understand about common emitter transistor characteristics, advantages of common emmiter configuration, why common emitter configuration is preffered for amplification? , and input and output characteristics of common emitter transistor.